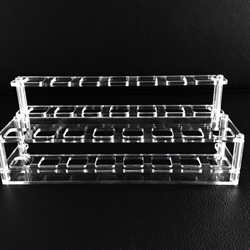 Display/Organizer stand that holds up to 15 4ml vials at a time. This is not Glass. Vial carriers are NOT pre-assembled, so we include a complimentary screwdriver. Great for Perfumers and Flavorists! Highly recommended to be used with the 4ml Dropper style bottles as shown in photos.